Feeding time at the zoo. Sometimes there's no other way to describe it. Within seconds of placing the plate on the table, it can end up on the floor raising a chorus of laughter followed by a shriek of exasperation. On some occasions, the carrot in the spaghetti bolognese is missed and gulped down in the blink of an eye. However, more often than not, it is spotted and becomes an interesting decorative feature that slowly slides down the kitchen wall. Inevitably, bowls become interesting hats but never ever after the contents are actually finished. Which in turn prompts howls of protest in the bath later that evening as dried rice pudding is brushed out of matted, greasy hair. Yes, welcome to the world of feeding wee bairns. But by and large, meals around the table are fun and enjoyable and pretty much encapsulate the family scene that I've always dreamt of. I believe that eating at the table is important and as we all get older, I hope that table will become the same social focal point that I grew up with. Eating out however, away from the safe, secure, wipe down-able confines of home is a little bit different and perhaps a slight return to hair pulling days of old (er Mrs FU hair pulling that is). We found this out late last year when we visited The DuCane in Great Braxted for lunch. 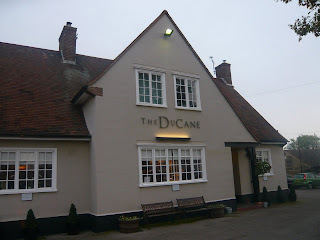 The drive out into the picturesque countryside to The DuCane, which received a barrel load of awards at the 2010 Essex Food and Drink Awards including Best Newcomer Restaurant, was surprisingly quick from the badlands of Hornchurch. Luckily the twins are still of an age where the soporific motion of the car sends them to sleep. No "are we nearly there yet? are we nearly there yet?" Which probably helped. Although the excitement quickly escalated once we woke them from their slumber and skipped across the car park hand in hand. Looking from the outside, though smart, I'd hazard a guess that The DuCane has spent the best part of its life as a regular pub before becoming a full time restaurant. So as we entered through the door, I must admit the sparse, clean decor inside threw my scent off a bit. In a kind of 'oh balls, this looks a bit posher than I expected' kind of way. However, as soon as we stepped towards the bar area, we were approached by a staff member who was very warm and welcoming and totally ignored the fact that my daughter had her index finger fully wedged up her nose. Which put me back at ease. We were sat down in a pleasant window boxed area and immediately we deployed the weapons of mass distraction; colouring crayons, sparkly stickers and paper, before perusing the menu. Having peeked at their website the night before to do some homework, The DuCane was true to its word, locally sourced produce was high on the agenda. Their list of suppliers is comprehensive to say the least. At the time, the restaurant was running a lunch special of two courses for £13.00 or three for £15.50 and it was pretty hard to decide. 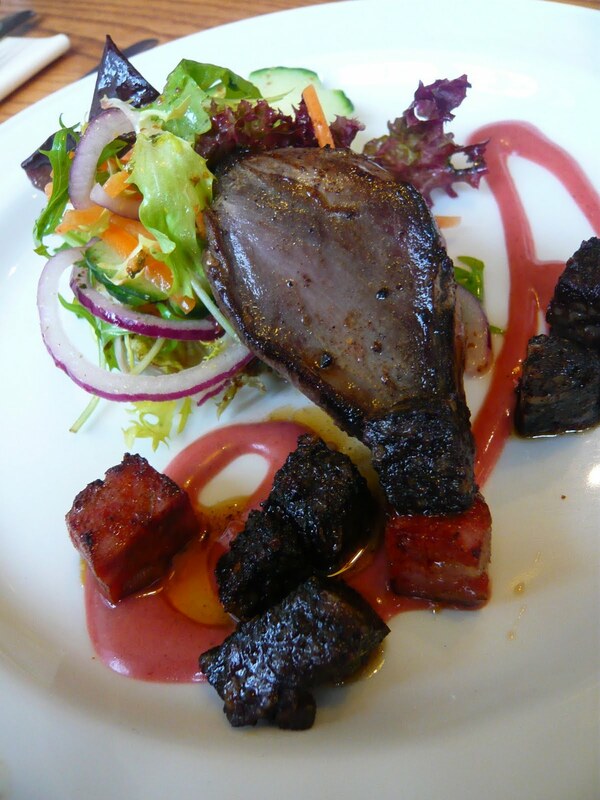 In the end I plumped for a Salad of Sautéed Black Pudding, Chorizo and Pigeon Breast with Raspberry Sauce and Roast Braxted Pheasant Breast with Savoy Cabbage and Game Gravy with English Bilberries and Crab Apple Jelly. Mrs FU decided to go snap on the starter but opted for the Linguine of Sea and Shellfish Braised in White Wine, Saffron and Herbs. The children's menu was equally impressive. Sure the old stalwarts were there, chicken goujons, burgers and chips etc etc but there was a reassuring byline that everything was fresh, made daily by hand. The offer of 'simply grilled fish with salad and new potatoes' appealed to our cosseting parental sensibilities so we went with that for the twins. Oh and we ordered some bread. We shouldn't have ordered bread. Don't get me wrong, when it promptly arrived, the bread tasted fantastic, the tiny bit I tried. And the portion was plentiful too. Maybe too plentiful and tasty because the twins attacked it and after a gremlin-esque five minutes, it was gone. Naturally, with bellies distended with dough (and not to mention freshly pressed cloudy apple juice) their hunger factor had somewhat diminished. And from then on it became increasingly difficult to keep them amused at the table. When our very pretty looking starters arrived, I managed to keep meat eater Isla sat still for a short while by feeding her a few morsels of chorizo and pigeon but the allure of the toilet became too fascinating. It took five visits to realise that she was more interested in dancing under the hand dryer, having her hair whipped up like some pre-school Hannah Montana than actually going for a wee-wee. Fin on the other hand was convinced that the Gruffalo was in the garden and kept peering out through the window, shouting at said imaginary creature and clutching a round candle holder from our table like a hand grenade. Although he did also try some of the starter and wound up fashioning a neat little red moustache from the raspberry dressing on his upper lip. And then for some reason via some kind of mental telepathy that only twins possess, the two decided they should have an ugly face competition complete with fits and giggles. 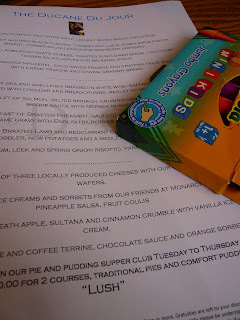 So it pains me to say that when our main courses came along, everything was scoffed at high speed as Mrs FU and I plunged into the free fall of stressed parents worrying that their kids behaviour was going to affect the other customers. Yes some of us do care you know. The food was certainly delicious, my pheasant was beautifully moist but I'm afraid that the plates were cleared without much consideration. The fact they were cleared is a good sign but I do know that Mrs FU suffered from indigestion afterwards. 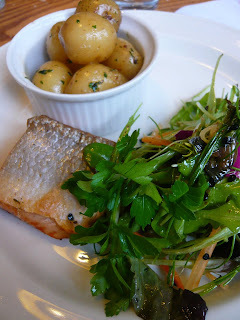 I ended up polishing off the kid's fish with no side effects at all (it was lovely). But what, surely what could possibly get us so uptight that we felt had to rush things so? I mean Christ, they're only kids after all. All eyes to Fin for this one, a dead ringer for Daniel Roche. Towards the end of our very brief stay, he decided to stand up on his seat and produce a perfectly melodious one-note piece of french horn from his bottom. I don't know if he did it because he was feeling uncomfortable or if it was purely for entertainment reasons but I do know that the elderly couple on the adjacent table heard it. And they weren't amused. I looked Fin sternly in the eye and said "Finlay! What do you say?" As if it was the most obvious thing in the world. Seeing as he was being so honest, the only response I could muster was to stoically and sagely nod, left eye twitching. Firstly at Fin. Then to the grim faced couple. And then to the table. Trying not to burst out laughing. Thankfully, our waitress came along shortly after with the very reasonable bill and we all dashed out. I am sure we shall return in the near future as the plaudits heaped on The DuCane are certainly justified. But perhaps it will be just the two of us. And have no fear, of course we shall continue to take our beloved pair to eat out more often. It's educational and fun for them and also for us, though I suspect it'll be a long while before we can expect anything remotely civilised. Like I said before, God knows where they get it from. 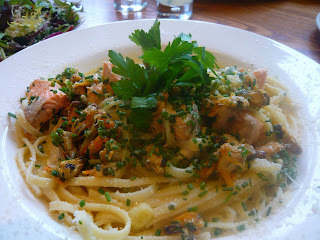 Linguine of Sea and Shellfish Braised in White Wine, Saffron and Herbs. 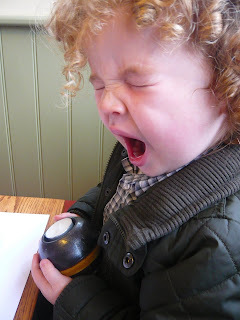 Oh what a shame that you could not savour the flavour FU... Great photo's - and you children look adorable! Trust me it get's better. Had many a tortured meal out when my 3 kids were little. They do kids so much better on the continent - usually the other customers are so much more supportive! Now eating out with my 15, 13 and 11 year olds is a true delight and they are cosmopolitan in their tastes and well behaved. Don't give up eating out! hahaha having no chilluns of me own, I can only imagine the horror. But nevertheless sounds like you had a great time, the food looks very good indeed. The standing on the table trumping episode made me burst out laughing...we've all been there. errr...just me then? Laughed out loud and then was overcome with the desire to dance around under a hand dryer. I bet it's brilliant. Great looking food and I'm very amused at the line about feeding your children "some more pigeon and chorizo"
Mine seems to behave impeccably in restaurants but like a jack in the box at home. I guess it's good it's not the other way round. I've not seen Outnumbered but yes it appears your littl'un looks a dead ringer. 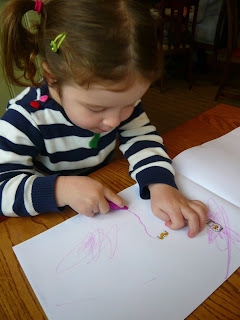 I wonder if you'd like to do a Dinner With Crayons guest post for me? You borrowed those adorable child actors for those photos, didn't you? You can't blame them really, it must be pretty boring sat around a table not being allowed to do anything fun in a new place! Gin and Crumpets - The hand dryer thing? Yeah it did look like fun, I'm just jealous because I have no hair. Meemalee - You STILL don't believe they're my children do you? Look they are also Holly's, now does it make sense? Pavel - Children should be seen and not heard! Now if you'll excuse me, I need to go off and wax my Victorian Dad Moustache. Love you blog- you kids are soooo cute. I like your sense of humour. The food looked yum! I'm pregnant with my first and already trying to figure out eating out with kids. Thanks for the kid-inclusive post! If you ever need to talk let me know... My twins are four and much changes... Some good some bad... But I can identify, it is a whole other world... Trying but unique. 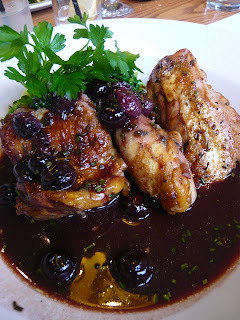 Winkypedia - thank you, the food was indeed yum despite the indigestion from some quarters.